Shares of Morgan Stanley are up 12% in 2013. If this is the new Morgan Stanley, investors aren't impressed. The bank's burgeoning wealth management division logged strong gains, but sharp declines from its trading division rattled investors Thursday. Investors also didn't seem to care that the bank beat analysts' forecasts for both profits and revenues. Shares fell more than 4%. As part of a major renovation of its banking business to move away from the risky behavior that nearly felled the bank during the financial crisis, Morgan Stanley has been building out its brokerage arm that caters to retail investors. Morgan Stanley is in the process of buying the rest of what was once the brokerage firm Smith Barney from Citigroup. The two banks had operated the brokerage firm as a joint venture since Morgan Stanley purchased a stake in 2009. Investors worry that profits and revenues in the brokerage business won't be enough to offset potential declines if Morgan Stanley's investment banking franchise loses it luster and trading revenues keep slipping. 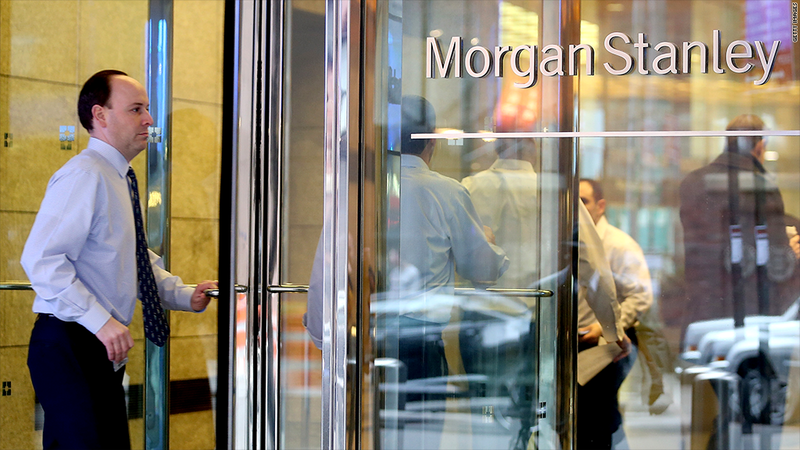 "What is Morgan Stanley giving up in trying to dominate the retail side of the business?" questioned Guggenheim analyst Marty Mosby. Breaking down the balance sheet. Morgan Stanley earned $1.2 billion, or 61 cents per share, on $8.5 billion in net revenues in the first quarter. Revenues in the wealth management division rose by 5%, while profits jumped 48% from a year earlier. But trading revenue overall fell 32% from the previous year, with debt trading falling sharply. Those declines were partially offset by investment banking revenues, which rose from a year earlier, helped by bond and loan underwriting. Morgan Stanley's return on equity -- a measure of how successfully a company returns capital to shareholders -- decreased to 7.6% from a year earlier. Gorman said the bank continues to target 10% but that would still lag its peers. Goldman Sachs' ROE was 12.4% in the first quarter. Morgan Stanley made some progress cutting compensation costs. Last year, compensation and benefits were roughly 64% of revenues. This quarter, that figure stood at 52%. "Morgan Stanley has historically been seen as the most generous bank on the Street, and that hasn't been a good thing," said Christopher Wheeler, a bank analyst at Mediobanca. Related: Goldman Sachs earnings were good. Too good? Looking ahead, CEO James Gorman was more sanguine than many of his banking peers about the health of the global economy. "We believe the broad economic outlook for the next several years is stronger than in the recent past," said Gorman in a statement, though he acknowledged "the global environment continues to have moments of fragility." Morgan Stanley (MS) is the last major bank to report first quarter results. Bank earnings from Bank of America (BAC),Goldman Sachs (GS),JPMorgan Chase (JPM), andWells Fargo (WFC) have been mixed to poor. Only Citigroup (C) managed to please investors.